The Lawrence Avenue Streetscape is a project that will have a major impact on our neighborhood. Some aspects will be beneficial, others not so much. The project plans to reduce Lawrence Avenue down from 4 lanes to 3 lanes on the majority of the stretch from Ashland to Western. 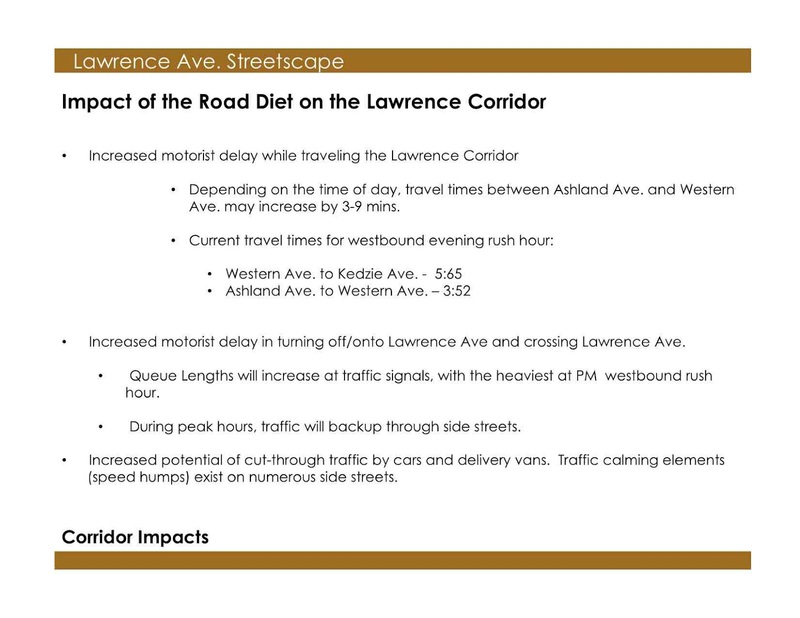 The data from the initial traffic analysis presented to the community (as shown below) indicates greater vehicular travel times on Lawrence and traffic backing up on side streets. 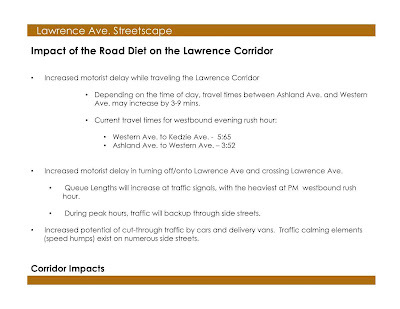 Traffic will most likely back up for blocks during morning and evening rush hours like it does currently on Lawrence Avenue west of Western Avenue. Ainslie is currently used as a short cut by some vehicles avoiding the Lawrence/Western/Lincoln intersection. Our neighborhood's concern is that if these estimated traffic numbers are conservative, we could experience hundreds of additional vehicles cutting down Ainslie every day during morning and evening rush hour. We need to be proactive and insist the Alderman's office incorporate traffic calming elements such as bump outs and storm water bump outs (as shown below) on Ainslie as well to alleviate the additional traffic. Cost savings could be achieved by the city if these elements are built at the same time as the Streetscape Project. Here is a link to the page on Alderman Pawar's Website where you can view the most current draft of the Streetscape Design. 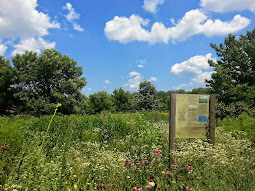 Note the draft does not reflect the current location of certain bus stops which were relocated last summer to the "far side of the intersection". 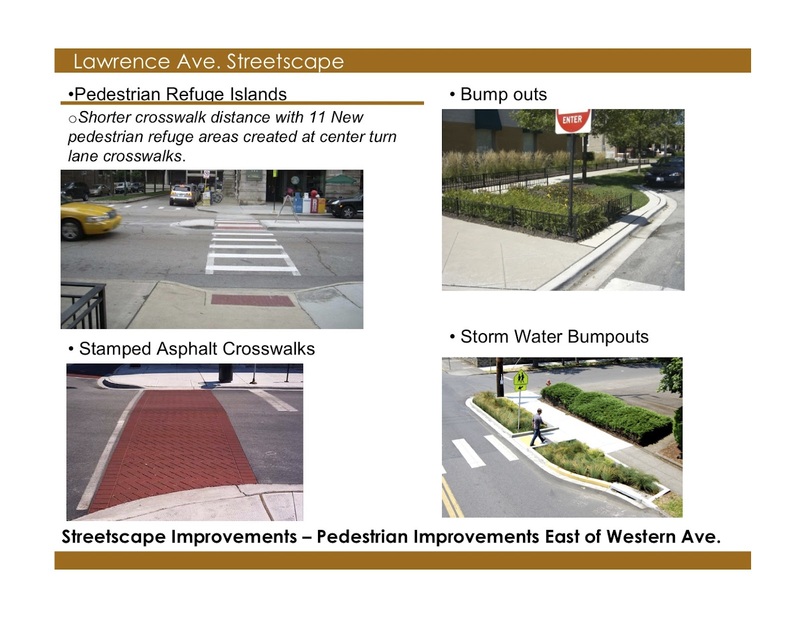 You can also view the full Lawrence Avenue Streetscape Presentation prepared last summer showing various design elements and examples of similar projects.